The power folk metal band from Italy is back with its fifth album. Being already 11 years in the scene they released the very promising debut “Heathenreel” in 2001, combining epic power metal with folk music. In their following albums the folk elements were slowly removed, resulting in the almost progressive power metal album “The Scythe” in 2007, where all folk elements are almost gone. Since this was their weakest album so far (according to many reviews and my opinion) my expectations weren’t very high, but fortunately I was wrong! This album is their folkest work so far and even though it is supposed to be acoustic, the orchestrations are so rich, that you can’t understand it at first listen! Acoustic guitars, drums, violins, keys and Damnagoras’ characteristic vocals create a unique sound, very different from any other “acoustic” work you’ve ever heard. There are also some electric guitars, but in very minor parts, adding a metal sound to the album. Except for the cover on “Heaven is a Place on Earth” and the two acoustic versions of their previous songs “The Winter Wake” and “The Wanderer” all the other songs are new. This album is much closer to “Heathenreel” and I believe the absence of electric guitars made the band much more inventive on the compositions of the songs. The lead melodies are based mainly on the many different types of guitars and secondary on the violins (synths and whistles are in the background). Aydan’s work on the guitars is remarkable since he mixed standard acoustic, piezo acoustic and classical ones with brilliance, creating an unbelievably solid sound. Of course the production of the album is at the high standards they always offer us! The album will be released on 14thof November in digipak and jewel case editions and will be preceded by an online single! Digipak version will include the acoustic version of “The Wanderer”, while there is also a song “Skywards 2008” available only in the Japan version. For me it was a very pleasant surprise, since I thought the band would follow other musical directions. 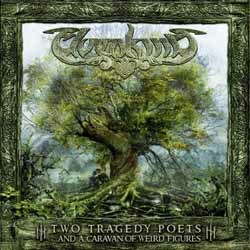 If you liked their earlier more folk works, you must check “Two Tragedy Poets”. Also if you want to listen to an interesting acoustic experiment with a folk power metal approach, don’t hesitate! You can also check their official pages for samples.